Years ago, Coast Guard rescue swimmer Dylan Holt left Kodiak, Alaska, with his heart in pieces. 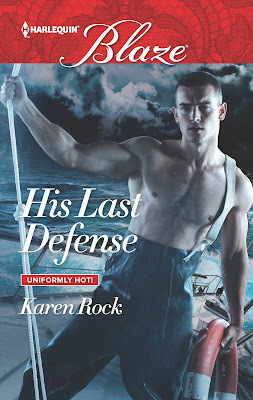 He thought Nolee Arnauyq and her mouthwatering curves were behind him—until he's sent to rescue the crew of a capsizing boat…including Nolee. And Dylan is definitely not ready for the too-familiar way his body aches at seeing her again. My review :- I absolutely loved this book with its flowing prose,steamy romance and lovely characters. This was definitely a 4.5 stars book with an enticing plot ,vivid description and deep and well developed characters. I loved Dylan Nd Nolee's story and look forward to reading more from the author. Award-winning author Karen Rock is both sweet and spicy—at least when it comes to her writing! The author of both YA and adult contemporary books writes red-hot novels for Harlequin Blaze and small-town romances for Harlequin Heartwarming. A strong believer in Happily-Ever-After, Karen loves creating unforgettable stories that leave her readers with a smile. When she’s not writing, Karen is an avid reader who’s typically immersed in three different books at a time, all in different genres. She also loves cooking her grandmother’s Italian recipes, baking, Christmas (no need to specify—she loves every bit of it), and having the Adirondack Park wilderness as her backyard, where she lives with her husband, daughter, dog and cat who keep her life interesting and complete. Learn more about her at her website. Thank you so much for your amazing review and hosting me today :) I'm so glad you enjoyed the book!